I was all set to apologize for revisiting Vlad Jr. so early in the season, but then I found out that I haven't written about him yet this year. It's always fun when top prospects come to my minor league stomping grounds along the banks of the Merrimack River in "Manchvegas", Manchester, N.H., the Paris of Hillsborough County. It's even more fun when said top prospect is playing for the Fisher Cats. I can watch Vlad dismantle Eastern League pitching from the comfort of the Sam Adams Bar and Grill knowing I can see him do it the next night as well. The question at hand is "How long does this last?" Vlad has been a multi-million dollar pro since he was 15 years old and while his lineage certainly played a role in the timing and the amount of his $4M contract, his play has done nothing to cast that signing into doubt. Vlad has been a good professional too, in terms of adjusting quickly to new levels, his ability and willingness to take a walk, his overall approach at the plate, and the obvious work he's put in on the defensive side, making big strides in just the 40+ games he's played here in the Great White North. His defense was the last thing we could pick on, but he's made himself reasonable defensively at 3B, to the point where his move to 1B or DH seems less inevitable. Otherwise, there's nothing to complain about here other than having to wait for another player who will still be a teenager when the season ends this year. Vlad has double-plus raw power, and some of it came pre-installed as game power. His Dad has done a good job with him, passing down his swing to an almost-identical extent while not passing down Dad's love of bad-ball hitting. Vlad is going to be good. Really good. Better, he's going to be fun. He's going to be a guy whose ABs you plan your bathroom runs around. I already do. I just don't know when this is all going to start in Toronto. I have been seeing him often as I am not sure he's going to be living free or dying for much longer. I really don't see a need for him to route through AAA although it can't hurt. His approach and his plate discipline seem advanced. If it's a service time issue he could see the majors by mid-June. If it's a PT issue, who knows? He is still just 19, although that seems to matter less and less these days. I guess the bottom line is that you need to own him if it is reasonable to do so in your keeper league. And if you have room and budget for a spec stash in your redraft league, short of Alex Reyes, Vlad could be the highest impact player that we see become available this summer. If you need a lottery ticket. Vlad could be it. I usually like to focus on high-ceiling prospects, especially with SPs, because who needs to spend on the learning curve for a back-half of the rotation SP performance when there are usually veteran SPs available to do that in all but the deepest leagues, usually a lower cost. But with SP prospects, and back-half-of-the-rotation starters there's something compelling about a solid floor as well. Sometimes you just want a guy who will give you a QS much more often than not, and simply not set fire to the performance of your top starters. Kolby can be that guy, I think. Kolby Allard comes into the draft injured (stress reaction, lower back) but with the promise of being generally considered the best non-college arm on the board. The left-hander is a bit small at 6-0/175 but brings an advanced curveball to the party. His mechanics are good and that adds to his promise. He'll take some time, though. Those back issues lingered into his pro career, but the Braves skipped High-A with Kolby and threw him to the AA wolves last year and asked him for 150 IP as a teenager, in his first tour in the high minors after he went from 6 IP in 2015, to 87.2 in '16. He did pretty well in AA but, as anticipated, his K rate shrunk and so far this year in AAA it has shrunk again. Just keep in mind that his AA performance was even a little better than it looks because he was out of gas at the end of last year and these numbers got scuffed up late as a result. Still, he's not velo-disabled, he has good sink to his fastball, and he locates it well. That sink helps to mitigate his HR susceptibility a bit. Additionally, he has an excellent deep curve which he commands well. And he's bringing his change along. This all adds up to more than the sum of Kolby's parts, but that sum is still below that of a top-half of the rotations starter. If you want to call him a #3, I'll stipulate that's possible but it is his ceiling. What I think his calling card will be eventually is a paucity of 5-run outings and a nice, comforting, QS%, and that I think that starts not too long after his call-up. 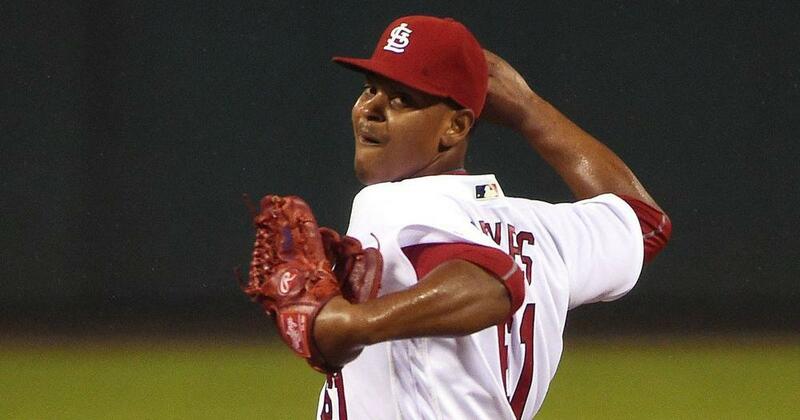 Alex Reyes is one of those guys that we tend to forget is still a prospect. It seems like we have been talking about him for a long time, and we have. Still, he's just 23, and only has 46 MLB under his belt, so he qualifies. Alex is working back after a much talked about TJS procedure and although we haven't seen much since, the 23 IP that we have seen so far from Alex, spanning 4 starts at 4 levels have been pretty good. I mean K rates of 66.7%, 40%, 50% and 56.5%, even in small samples, will catch your attention. I went back to see what I had written over the years about Reyes and almost none of it can really be applied at this point. One thing I was concerned about a couple of years ago was what I called a "stubby" delivery (he didn't finish really well) and an inability for him to repeat his mechanics. That's what I am waiting to see. Post TJS, pitchers generally have to rebuild their delivery from the ground up and the process of turning this is a cognitive function as opposed to the associative function a pitcher's mechanics had probably settled into prior to the surgery, hopefully, allows them to flush out any issues they might have struggled with before the surgery. Again in Alex's case, that was largely repeatability, which led to control issues. If we want to lean on these small samples (hey, what else do we have?) we can see some control improvement, which is positive. And we can assume that all of this might even get a little better as we go along and his mechanics become more rote. That's all speculation of course, but at least the problem hasn't gotten worse and hey, the Cardinals know what they are doing in this area. Don't underrate how big a plus that is here. Alex's stuff was excellent and it appears it still is. Reyes throws mid-to-high and he backs that with an excellent and deep curve at -17, -18, -19 mph. It's devastating at times, especially if Alex can wrangle his mechanics to stay in leveraged counts. His change was potentially plus before the surgery at a -7 or -8 or so. I think his rehab probably solved some mechanical issues. I think time and experience and maturity will solve others. His stuff is compelling and he has a very high ceiling. Take the risk. The Cardinals have aimed him at the rotation. They say that because he's starting the year late they have not set an innings limit and while they'll take care of him, he's good to go the rest of the way.